When school ended on on Tuesday, December 29 2009, I rushed from work to the bank. Usually before an international trip, I head to Bucheon to KEB Bank where I sort out my FOREX. This time, I thought I'd just do it at the airport. My flight was at 18:20, but I had to leave my apartment by 3pm at the very latest. I have to get a cab from my apartment to a bus stop. I wait for the "Airport Limousine" (bus) and within an hour, I'll arrive at Incheon Airport. 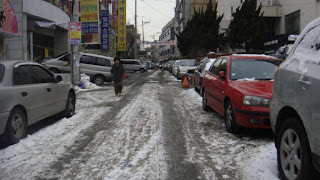 There was a lot of ice on the roads and at the risk of slipping and hurting myself, my building manager helped me get a call taxi. Within minutes, it arrived at my apartment. The Airport Limousine schedule runs on 20-minute intervals. When the cab driver dropped me off at the stop, the bus pulled up from behind and I literally got out of the cab straight into the bus. As I sat down, I thought, "This MUST be a good sign that that this will be a good trip." Sometimes I have to wait in the freezing cold for the bus. When the bus arrived at Incheon Airport, something didn't look familiar. I'm always dropped off right at the door of Departures, but this driver dropped us off at the Arrivals terminal. It took me about 15 minutes to get to where I had to be. The airport was buzzing with holiday travelers and it had a very festive-y vibe. After 20 minutes of waiting in the Check-In queue and slowly losing my patience with parents who couldn't control their children, I was ready to check in. "Excuse me, you have to go to Immigration Office over there (pointing) to get a multiple-entry visa," said the lady behind the counter. WHAT is she talking about? I have a multiple-entry visa. I told her to look again. She was on the wrong page. Fine. Sorted. She asked her colleague in Korean if South Africans need a visa to enter Thailand. I told her in English that I didn't need a visa. I requested an aisle seat, but she said the flight was tight, and I'd have to wait for her manager who was in charge of seating. She had a very confused look on her face. I told her that I'd be OK with sitting anywhere. I also asked her twice, "Is there a problem?". She finally issued me with my boarding pass. I sorted out my FOREX and was off to my boarding gate. 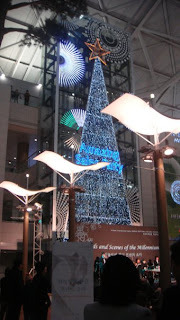 I had my netbook with me and I got online (thanks to the incredibly easy to access free Wi-Fi at Incheon Airport). I sent a few last minute text messages to some friends before boarding my flight.